James and I were chatting the other day about our blog and how he is the main contributor. I do play an editing role on most of the posts but every once in a while I like to make a contribution that is all my own. Today is just the day for such a post. I have had the past few days off from work since it was time for teacher conferences. I am very blessed to work just less than full time as a reading assistant and I get to enjoy the freedom from other full time teaching responsibilities such as conferences, parent phone calls, maintaining a classroom (complete with cleaning, decorating and prepping for lessons). That being said, I have still had to transition back into the working life after my summer vacation, I know, I know rough life, so I really do appreciate the days off when they come. I love to do many artistic and craft related things in my free time and one of those things is sewing. This summer I finished a t-shirt quilt, which was my first and maybe only BIG sewing project. More on that later perhaps. For now I wanted to share about two up-cycle projects I just did this week. Think of up-cycling as taking something old and discarded and turning it into something new and exciting. 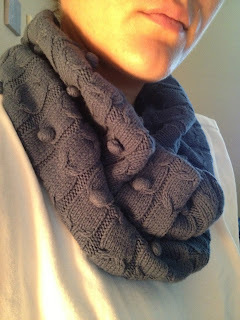 My first project was made out of an old sweater. I really liked the sweater when I bought it but it was one of those purchases that looked great in the store and then when you got it home and put it on the next day you had no idea why you would ever buy something so ridiculous looking. Well, needless to say as much as I loved the design on the sweater I never once wore it in public. I cut it up one day to use the pieces for something else and then it just got shoved into the scrap box. I re-discovered it and decided to turn the sleeves into a scarf. 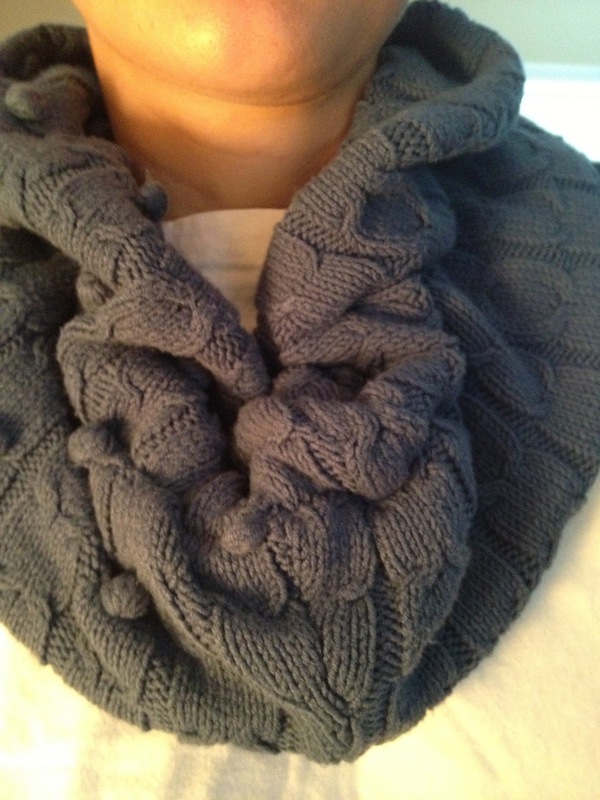 I sadly did not take any pictures of the sweater beforehand but below is the finished product. 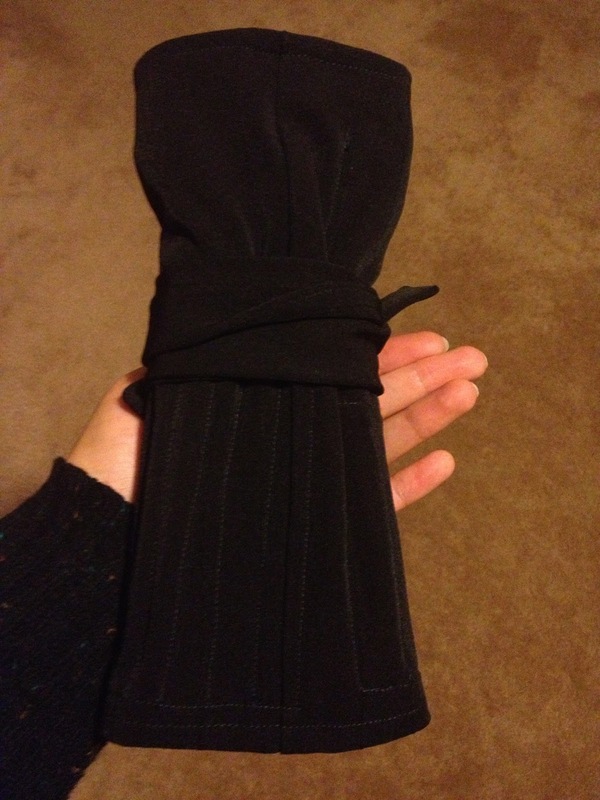 I looped the sleeves together and then ran a strip of elastic down the center to make it bunchy. I attached the ends together to make it a loop and voila...an infinity scarf. I am excited to finally get some use out of that sweater I bought about 5 years ago. My next project was converting an old pair of pants into a crochet hook organizer. I made a different hook organizer about a year ago when I became inspired to get organized in the craft department. I'm pretty sure that venture will be a life-long process, but in the meantime I did, at the very least, get my crochet hooks organized. There were a few things I didn't like about my first attempt. 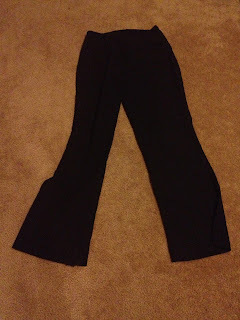 There were not enough pockets, the hook spaces were the wrong size and the sewing was less than an amateur attempt. So, when I found the old pair of pants in the scrap bin I knew exactly what I would make. I also made a plan this time...utilizing the amazing sewing skills my mother-in-law had shared with me during the t-shirt quilting. After about four and a half hours of stitching, ironing, folding, un-stitching, re-ironing, staring into space thinking about which way different seams should line up...I had a new crochet hook organizer! The best thing about both of these projects is that they are custom made and they were essentially free since I used materials I already owned. I hope this inspires you to find that old sweater, bookshelf, flower pot, or pair of pants and turn it into something new and exciting! I love that you used materials you already owned. I have a gray sweater vest I accidentally shrunk (it was Kirk's) that I'm still trying to figure out what to do with. It would be great to see a step-by-step process for your next up-cycle project!